At some point during the creation of the Geoconnect3d project, when a lot of survey geologists from around Europe were crammed in a room and encouraged to think creatively, I realised that the proposal was potentially quite innovative and we (Geological Survey Ireland) should get on board. The problem was, the idea involved crossing borders as part of the challenge. And although the question of the border on post-Brexit Ireland is currently extremely topical, our northern geological survey neighbours (with whom we have had lots of good ‘all-island’ collaboration already) were not at the GeoERA party. So we came up with the concept within Geoconnect3d of the ‘one-country pilot’, in which Ireland could participate in the innovation by being a difficult first customer. But what is that complex geological history – told simply? Ireland now lies at the wind- and wave-swept western edge of Europe, and it has been Ireland’s proximity to ocean margins through much of its geological history that has put so many lithologies and tectonic events in such a small volume. 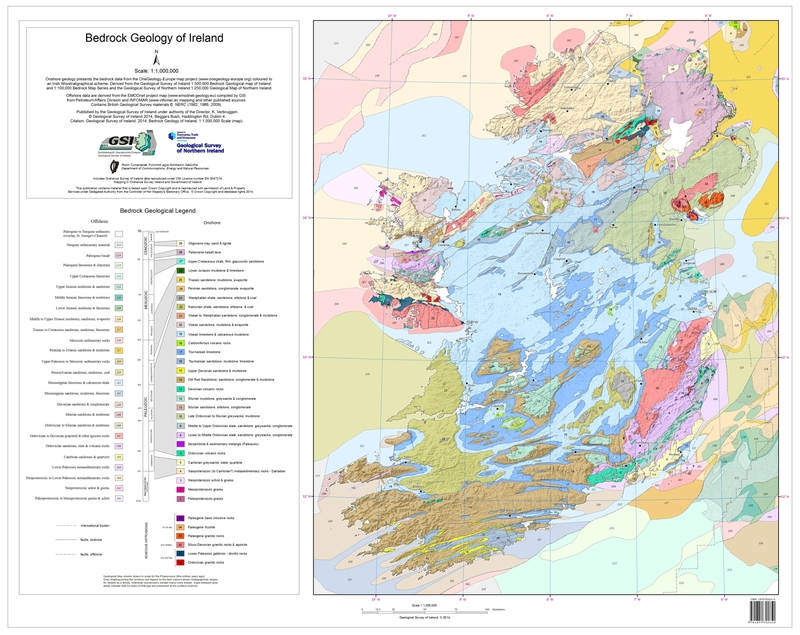 1:1M bedrock geology map of Ireland. To download this map, click on the picture. Precambrian rocks in the northwestern and southeastern corners of Ireland originated on different palaeo-continents (Laurentia and the Ganderia fragment of Gondwana, respectively), separated by the Iapetus ocean. The more-extensively exposed Laurentian part includes basement gneisses 1780 million years old and a Precambrian cover sequence that includes glacio-marine deposits from the ‘Snowball Earth’. As Iapetus closed by subduction during the Ordovician and Silurian periods, volcanic arcs collided with the continents, causing successive orogenies and forming mineral deposits. Final ocean closure and the resulting Caledonian Orogeny raised the vestiges of Iapetus into a composite mountain belt. Continental collision was accompanied by intrusion of voluminous granites – exposed, yet-to-be exposed and re-buried. Erosion of the Caledonian mountains supplied sediment to extensive ‘Old Red Sandstone’ alluvial plains; the Munster Basin is 6 km thick. These sediments preserve fossil footprint trackways, the oldest in situ record of a terrestrial amphibian. A Carboniferous transgression was followed by extensive limestone deposits in a shallow sea that was rich in invertebrate shelly life. Early Variscan extensional tectonics led to block-and-basin faulting and circulation of hot fluids, forming several large zinc and lead base metal deposits, including, at Navan, the largest zinc mine in Europe. Two of the deepest preserved limestone basins are the target of another GeoERA project – Hotlime – exploring their geothermal potential. The limestones are extensively exposed in the Burren, Co. Clare, forming one of the best places in the world to study karst landscapes and the control of groundwater by fracture patterns. During later Carboniferous times, global sea level fluctuations brought coal measures, and deltaic sandstones and shales. Exposures of these rocks on the Cliffs of Moher coast of Co. Clare attract hydrocarbon geologists from around the world to study reservoir systems exposed in 3D. Ireland was on the northern edge of the Variscan orogenic belt and its effects were relatively slight. Rocks of the Permian ‘New Red Sandstone’ desert and succeeding Mesozoic strata are preserved on land in the northeast, where they have been protected from erosion by a covering of Paleogene basalt lavas, but their main occurrence is offshore. Great thicknesses of Mesozoic sediments accumulated in subsiding basins, formed from tensional forces related to the beginning of North Atlantic opening. These basins host hydrocarbons at different stages of production or development and are potential reservoirs for geological storage. Crustal stretching and the Icelandic plume created large volumes of basalt magma during the early Paleogene. Extensive suites of dykes intruded the northern half of Ireland and vast basalt lava flows issued from the fractures, including the world-famous columnar-jointed Giant’s Causeway. Centralised magmatism built up large volcanoes, the roots of which are now exposed by erosion in the cross-border area of eastern Ireland. The Pleistocene glaciations carved corries and U-shaped valleys that give the Irish mountains grandeur beyond their relatively low height. In the lowlands, the bedrock is mostly obscured by unconsolidated glacial deposits. Drumlin fields are well developed and the Irish language gave the word ‘Esker’ to the long ridges of gravels deposited by sub-glacial rivers. So hard border or soft, all-island or not, Ireland has a fault network and diversity of geomanifestations that should provide a robust test of what our Geconnect3d partners in their neighbourly clusters can come up with.